The Birds Nest has been converted from a traditional cow byre, to provide comfortable holiday accommodation, which retaines the charm of a country cottage. 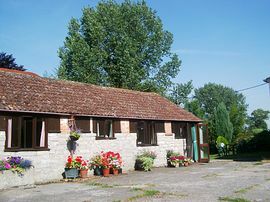 Situated on a working farm in the peaceful Somerset countryside, Orchard Farm offers affordable accommodation for a relaxing West Country holiday. This cottage offers easy access to the many attractions of the West Country. It is only a mile to the picturesque market town of Castle Cary, while other historic towns close by are Martock, Bruton, Wincanton, Yeovil, Shepton Mallet, Street, Glastonbury, Sparkford, Langport, Bristol and Bath. Some of the nearby attractions include Wookey Hole and Cheddar Caves, Lytes Cary, Somerset Levels, Montacute House, Haynes Motor Musem, Yeovilton Fleet Air Arm Museum, Clarks Village and the Bath and West showgrounds. Suitable for wheelchair users or people with restricted movement. No steps, wide doorways and passage. Extra space in bathroom/toilet, but no walk-in bath/shower. All controls at waist height or lower. Linen, including towels, is provided free of charge and beds are made up ready for your arrival. One (exceptionally two) well-behaved pet allowed. Extra charge of £15. 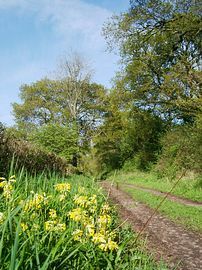 Lawns next to the cottage allow visitors to relax in the peace and quiet of the Somerset countryside. Garden furniture is provided and barbecue facilities are also available on request. Local Services: Castle Cary, a historic market town one mile away, has all normal facilities of shops, restaurents, garages, etc. The M5 passes 20 miles to the north west, and the A303 trunk road from London to the South-West is 4 miles away. Castle Cary is between Shepton Mallet and Yeovil. If you are traveling on the A303, turn off at Wincanton or Sparkford and follow the signs to Castle Cary. Orchard Farm is situated at Cockhill, southwest of Castle Cary. From Castle Cary take the B3152 towards Sparkford and Yeovil, turn right just after leaving the town. We are the second farm on the right, half a mile from the turn-off. Weekly rates range from £210.00 in winter to £350.00 in summer. Please note that these rates include electricity, heating, water, linen, etc. Short-breaks are welcomed outside of the peak holiday season.